You're almost done already! “Suitable for Chimera” means not too huge... generally, depending on your computer, alignments of up to a few hundred sequences should be fine. An alignment (here) of ~1000 sequences, length ~500 was OK on my desktop and laptop Macs, but took a couple of minutes to open. Open both the structure and sequence alignment in Chimera. Chimera reads several common alignment formats. 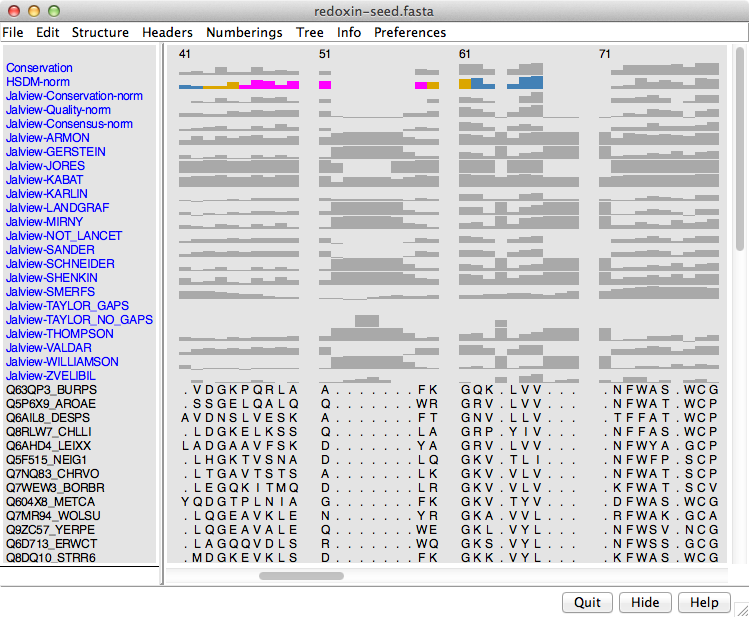 Sequences are shown in Multalign Viewer. You can change coloring, font size, etc. with Preferences... Appearance in that tool. Verify that the structure is associated with a sequence in the alignment. A colored rectangle will appear behind the name of the sequence that is associated. 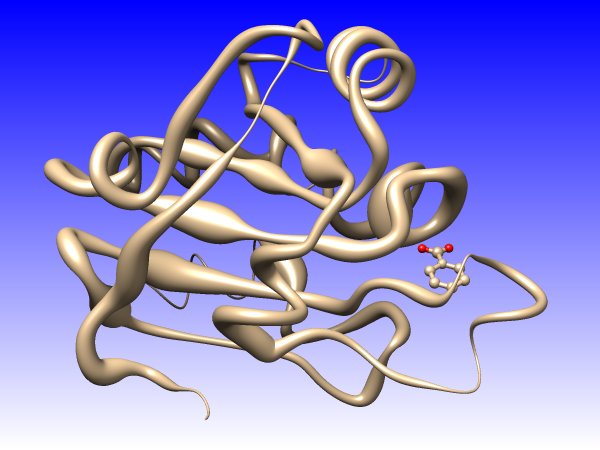 The structure will automatically associate with the most similar sequence if within the mismatch tolerance (default is up to 10% of structure residues, but this can be overruled, as shown for Example 2A). My example alignment has a sequence that exactly matches the structure sequence, but mismatches are fine for this purpose as long as the register of the structure sequence with the alignment is still correct. The SDM and HSDM matrices mentioned in this paper are only available in Chimera 1.10 and newer. This general process is also outlined in a helpdesk post and the Sequences and Structures tutorial. 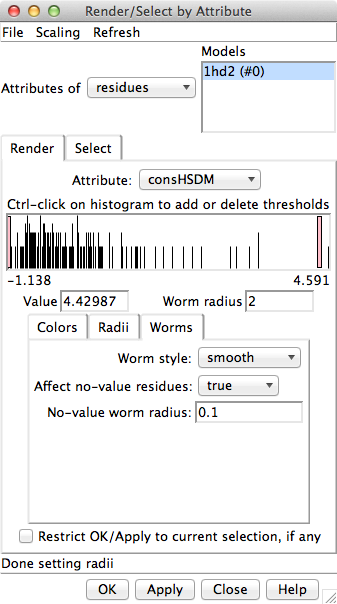 You can also save the calculated conservation values to a file; more about this below. There are many online resources for getting or making sequence alignments for your protein(s) of interest. Here I'll show just a couple of examples from that long list. Important considerations are alignment diversity (how broad a set of sequences should be included?) and quality (is the alignment accurate?). These may have a greater effect on the results than the specific measure of conservation that is used. 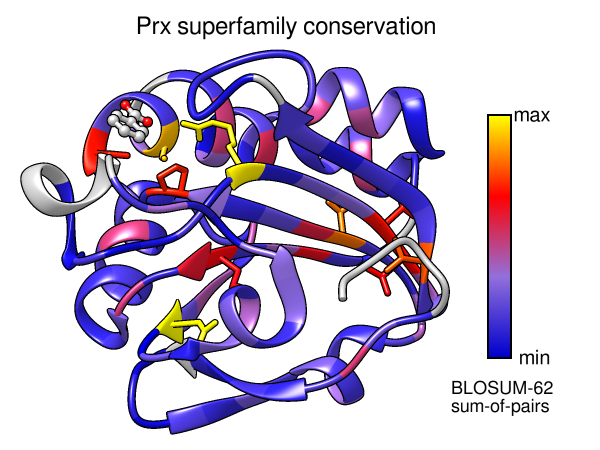 How did I know this PFAM family goes with structure 1HD2? One way is to look at the RCSB PDB entry 1HD2 “External Domain Annotations.” Another way is to search PFAM for “1hd2” and then look at the “Sequence mapping” for that structure entry. I prefer to get the FASTA format from PFAM, as the additional annotations in Stockholm format make the file bigger and sometimes cause problems. PFAM alignments may include blank columns, which can be removed in Chimera or Jalview. Force association to the best-matching sequence. 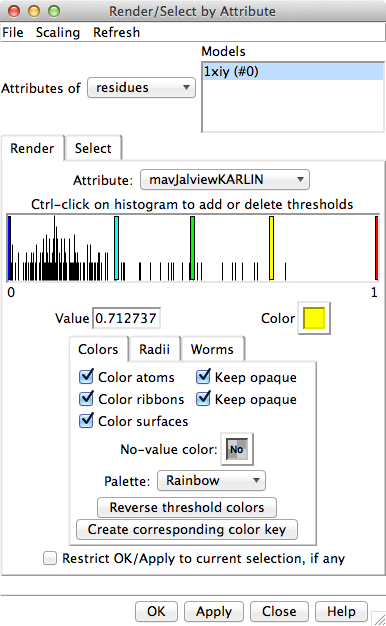 Multalign Viewer menu: Structure... Associations. In this example, even though the best match (sequence Q8MUN0_PYRRU) has 74 mismatches, the remaining >50% sequence ID is enough to get the correct register of the structure with the alignment. Find a structure more similar to at least one of the sequences in the alignment (not always easy). For example, PDB 1XIY associates automatically with sequence Q5MYR6_PLAF7 with just 2 mismatches. 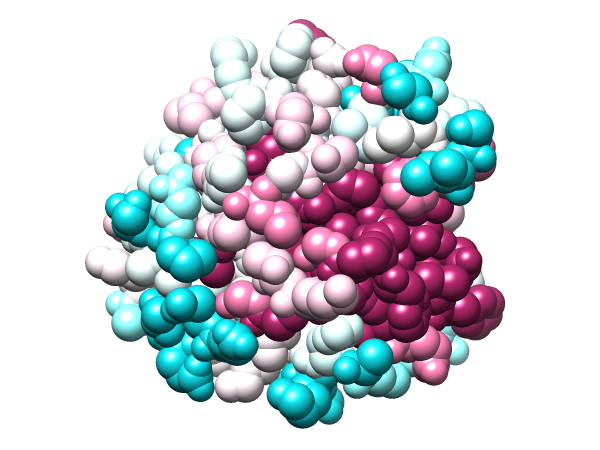 The list of structures for the redoxin family at PFAM shows that this structure and sequence go together. Then you can proceed as in Case 1. 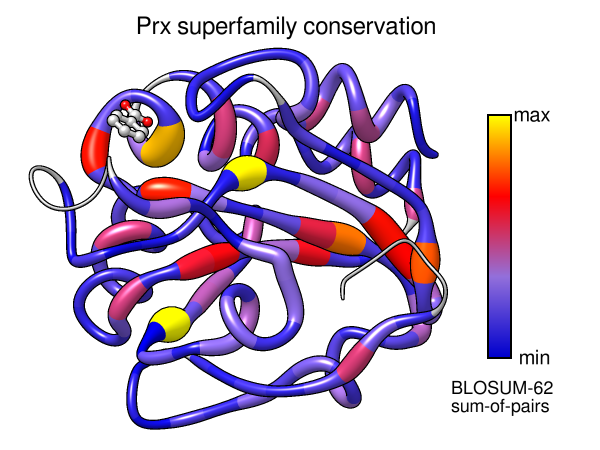 Given a protein structure, the ConSurf server estimates the evolutionary conservation of amino acid positions based on the phylogenetic relations between homologous sequences (details...). It also works on nucleic acids. Choosing to show the results in Chimera will download a *.chimerax (Chimera web data) file, which in turn references URLs for several files of results at the ConSurf website. 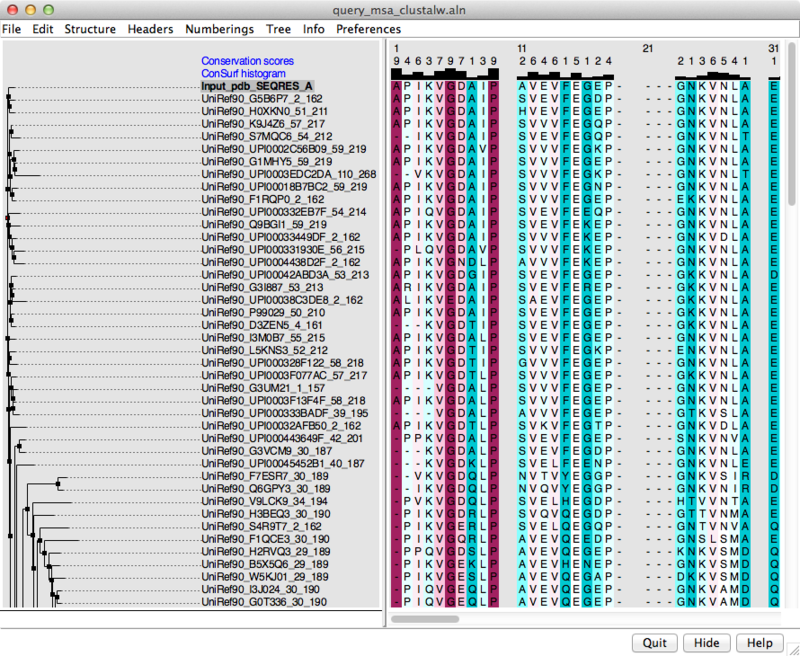 Opening the chimerax file loads everything into Chimera: the structure and a sequence alignment both colored by ConSurf conservation scores. 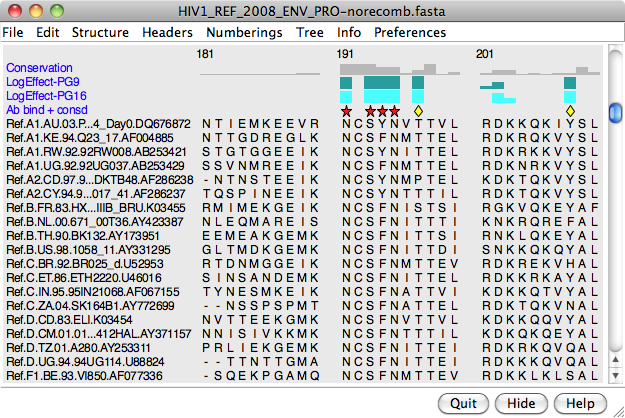 The alignment includes a phylogenetic tree representation on the left and ConSurf scores as two custom alignment headers (integers and histogram) across the top, as shown in the figure. Best to save a Chimera session with these results, since they won't be kept forever at the ConSurf website. Besides using the ConSurf scores, you can still show the Chimera Conservation header for the ConSurf alignment (turn it on using the Headers menu in Multalign Viewer), apply any of the AL2CO methods, and render attribute mavConservation, as in Case 1. You can un-show the tree using the Tree menu, and of course change the display style of the structure. See another ConSurf example with more details on the chimerax and results files. Use another program (e.g., Jalview) to redundancy-filter or otherwise cut down the size of the alignment, then use the smaller alignment in Chimera, as in Case 1. Note redundancy-filtering is not as straightforward as you might think; different programs use different algorithms and will give different results. Jalview finding (July 2014): apparently the gap character is treated the same way as an amino acid character, so in alignments with appreciable gaps/insertions, pairwise %IDs are calculated as artificially high (in my opinion) and redundancy-filtering removes more sequences than it should for the specified %ID threshold. Cons: you have to specify the target atoms or residues, and if using residue numbers, different assignment files would be needed for structures with different numbering (and for alignment-derived values, different placement of gaps/insertions relative to that alignment). If multiple structures are open, one should be careful to assign the values to the intended structure only. then your new custom attributes will appear in Render by Attribute for coloring, etc. as shown in the figure. redoxin-anno.txt - a whole slew of conservation measures calculated in Jalview using AACon, processed and reformatted into the Chimera header format. You can see from the figure that most of these measures suffer from poor handling of high-gap-fraction columns. if any structures are associated with the alignment, residue attributes corresponding to your custom numerical headers will be available in Render by Attribute for coloring, etc. as shown in the figure. Custom headers can also include symbols [image]. used a hideous process (due to my limited programming skills... I'm sure you could come up with something much more elegant) as described in the comments of my fortran program jalview2hdr.f, involving minor manual editing and some string subsitution with a sedfil before running the program. I did this mainly as an academic exercise. In general, I don't see an advantage of the Jalview-AACon measures over those currently available for less effort via Chimera-AL2CO. Findings (July 2014): the AACon service rejects alignments with >5000 sequences or >1000 columns and will fail silently if there are symbols other than for the standard 20 amino acids (e.g., ambiguity codes B, Z, X, or codes for rare amino acids U, O). Finally, note there are more complicated approaches (as compared to simply evaluating the conservation in each column) for analyzing patterns of amino acid conservation: correlating residue changes with the evolutionary divergences in a phylogenetic tree (Evolutionary Trace, e.g., web server, Java implementation JEvTrace), various methods for detecting correlations between different residue positions (e.g., Correlated Mutation Analysis, Direct Coupling Analysis, mutual information, protein sectors), etc. Results of such analyses can also be mapped onto structures.